WHAT THEY ARE: With hotter temperatures, more water evaporates off the oceans, and the atmosphere can hold more moisture. Research shows that the amount of water vapor in the atmosphere has already increased. That means that there is often a lot more water available to come down as rain. Climate scientists have already shown that increasing greenhouse gas concentrations as a consequence of human activity are partially responsible for the average global increase in heavy precipitation. WHY THEY'RE IMPORTANT: Extreme heavy downpours are consistent with what climate scientists expect in a warming world. Across most of the country, the heaviest downpours are happening more frequently, delivering a deluge in place of what would have been routine heavy rain. 40 of the lower 48 states have seen an overall increase in heavy downpours since 1950. 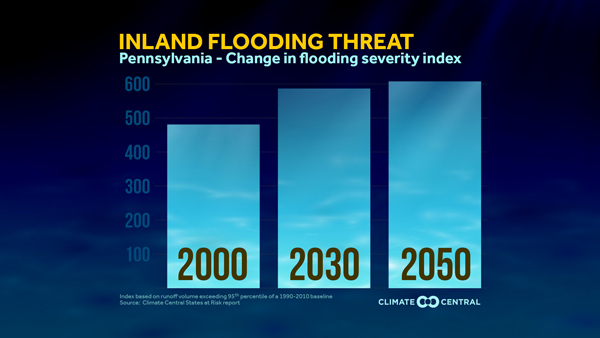 The biggest increases are in the Northeast and Midwest, which in the past decade, have seen 31 and 16 percent more heavy downpours compared to the 1950s. WHAT IT IS: As global temperatures rise, the hottest temperatures and the number of areas affected by extreme heat are also on the rise. Extreme temperatures that only occurred once every 20 years in the 1960s now occur every 10 to 15 years and record highs are outpacing record lows by ever-greater margins. Even in recent years, during which global temperatures have not increased significantly, the total land area affected by extreme heat has increased. The length and frequency of heat waves are both expected to continue increasing through 2100. WHY IT'S IMPORTANT: Heat is the number one weather related killer, and as carbon pollution continues, global temperatures will keep climbing, bringing hotter summers and more extreme and dangerous heat. Excessive heat can reduce or overwhelm the body’s ability to regulate its temperature, triggering conditions like hypothermia or heat stroke. Some research suggests that a five-fold increase in the number of excessive heat event days across the 40 largest U.S. cities by mid-century is possible, nearly doubling the total number of excessive heat event mortality compared to 1975-2004.